What are the origins of the kanji for sushi? Next: How many kanji are there? Sushi means "vinegared rice". It does not mean "raw fish". 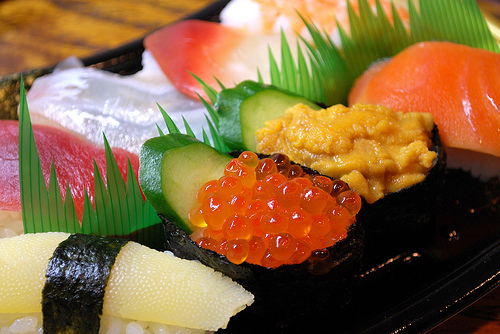 The food called sushi in Japan is not a dish of raw fish, but a dish of a kind of rice. Raw fish alone, without rice, is called sashimi. The rice used in sushi, sushi-meshi, is made using rice vinegar [o-su (お酢)] and sugar mixed with cooked rice. Forms of sushi include chirashi-zushi (散らし寿司), "scattered sushi", maki-zushi (巻寿司), "roll sushi", and edomae (江戸前), balls of rice with a topping. Items commonly used for sushi include seafood, cucumbers, aubergines, and pickled daikon as well as egg omelette (tamago-yaki). Sushi restaurants in Japan also serve such things as ham, avocado, fried chicken, and grilled pork on sushi rice. Sushi comes from the word sui meaning "acidic", like vinegar, su (酢) in Japanese. The -shi is an adjective ending used with i adjectives (see What is an i adjective?) at the end of sentences.